Available exclusively for Farmwell clients. The Farmwell Platform is a highly profitable business model programmed into “cloud” software. It’s technology that lets farmers set their own prices. The Farmwell Platform enables farmers to bypass middlemen by selling directly to consumers online – in a way that’s very easily managed. Before, only the smallest farmers could sell at premium prices. Medium and larger farms were at the mercy of middlemen. They were stuck with lousy wholesale prices because farmer’s markets can’t handle volume. ...And taking orders by email or phone is simply out of the question when you have a serious farm to run (not to mention the logistics nightmare, or trying to get paid). That’s why we built the Farmwell Platform. It’s for professional farmers to market their produce at premium prices directly to consumers – without admin or logistics hassles. It’s e-commerce, CRM and logistics management software that’s custom built and custom-branded for our clients. 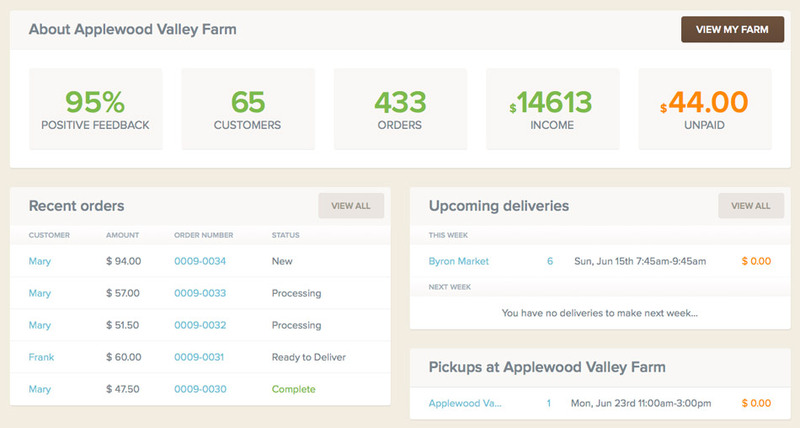 The Farmwell Platform is a disruptive force that’s changing what it means to be a farmer. An online shopping experience customers love. Show your customers how great you are. Is it fresh? Is it heirloom? How is it grown? Customers see what they want to know. Your customers love knowing when your food is at its peak freshness. Customers want to choose where and when they pickup their food. We make it easy for you to delight them. Your customers automatically get driving directions from their own home. All order information on one page. See all communication about each order. Make changes, update quantities, add/ remove products. Customers know exactly what's going on (and don't have to email you). Make notes and reminders to always stay one step ahead. How much do I need to harvest? How many boxes to pack? Who hasn't yet paid? 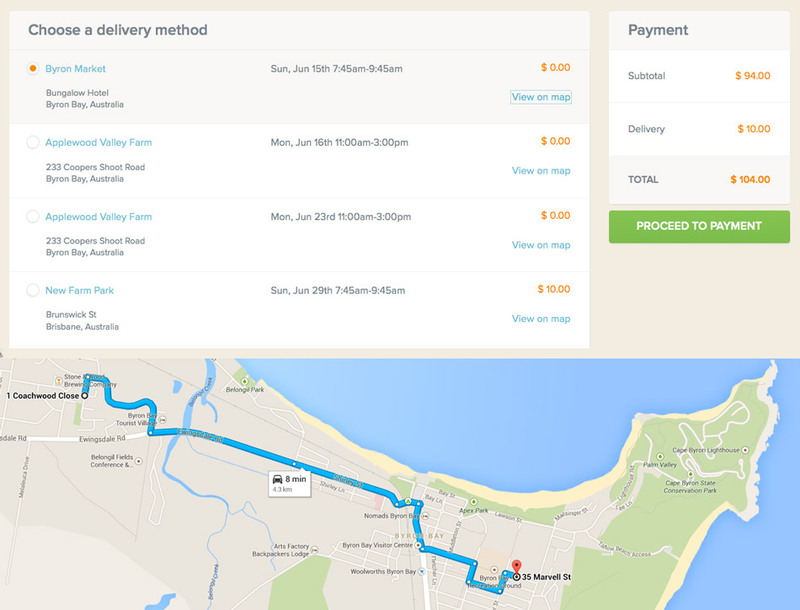 Is this delivery site worth our time? Farmwell gives you answers to these important questions at a glance. 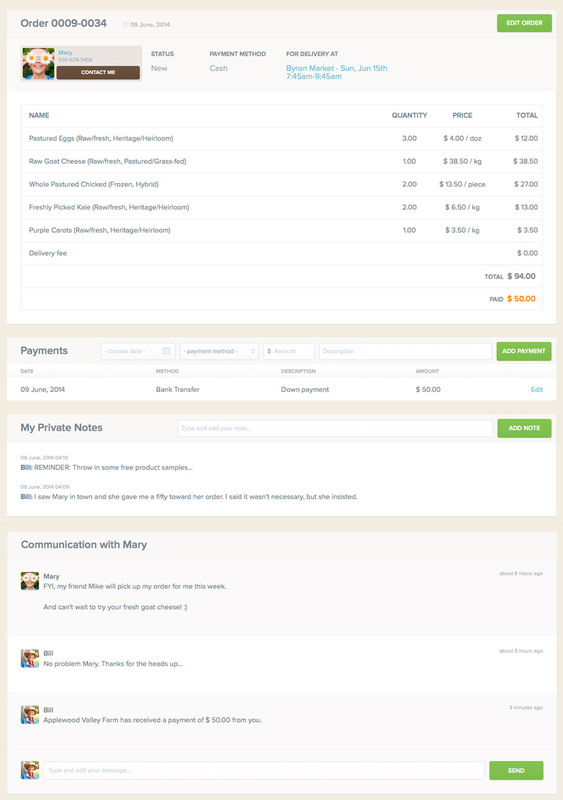 Track sales, payments, feedback and know exactly what's going on with each delivery. 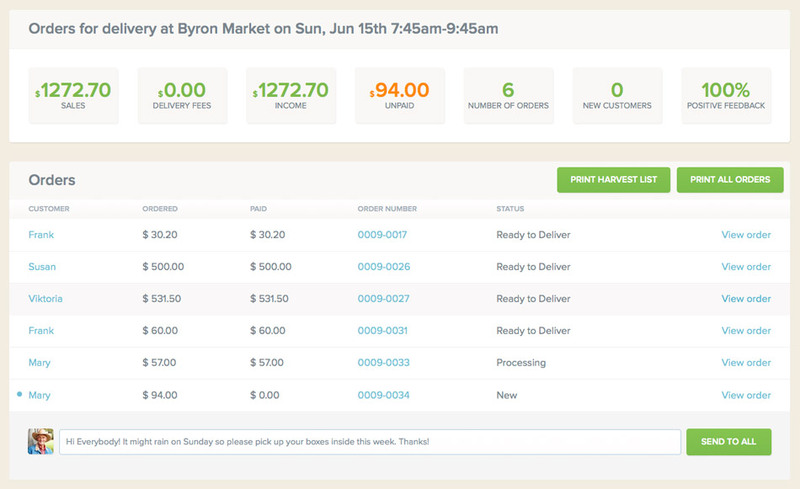 For each delivery you can print a complete harvest list, packing slips and all invoices at once. 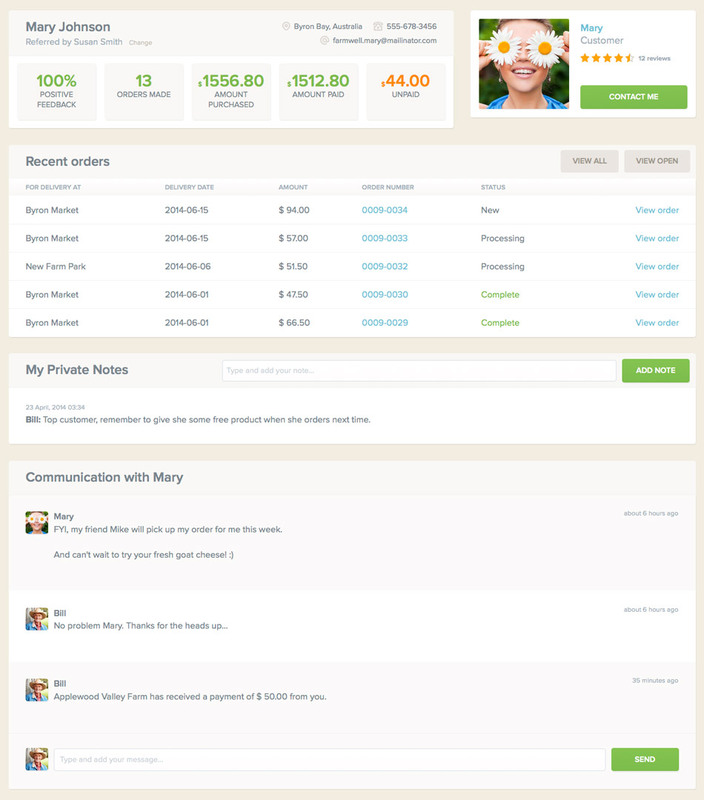 Send messages to all customers of a delivery in one go. A 360° view of each customer. When you know your customer, it's easy to keep them happy and coming back for more. Track referrals, see all important numbers and facts. Notes and message history exactly where you need them, when you need them. See a customer's entire order history. Reply to customer questions instantly. List and manage your food like a pro. Local food is about quality, trust and educating consumers. 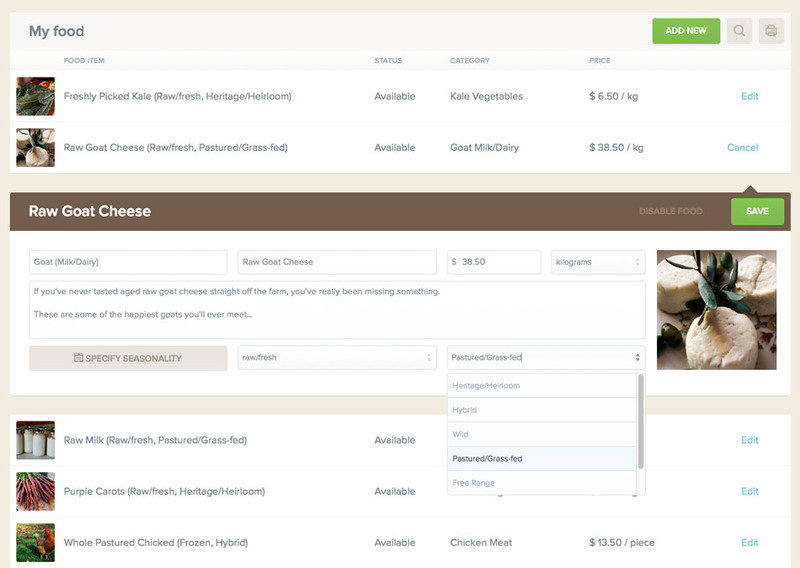 Farmwell lets you tell your food's story quickly and easily. 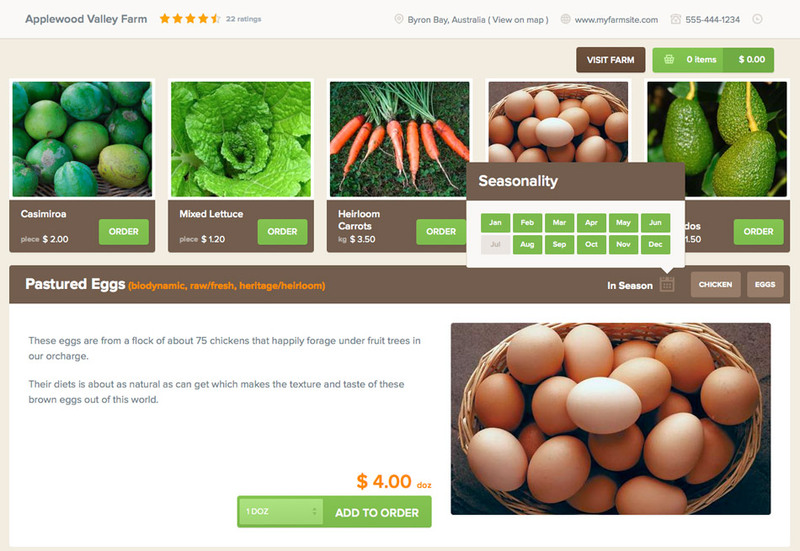 Upload a picture, specify when it's in season and enter important information every customer needs to know. Gain valuable feedback from your customers every time they order and show-off your good reputation to prospects. Expensive organic certifications become redundant as local communities self-certify themselves. Nobody likes surprises, especially in business. A complete overview of your business lets you stay on step ahead. See your progress and track your success with a bird's eye view of your business.